We have a new flavour for you and it combines both coffee and cacao into one bar: the Vitaminbar Coffee Cacao. 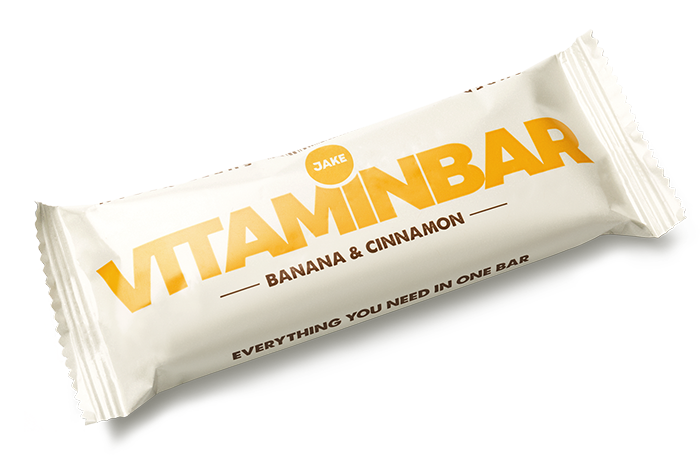 As you are used to from Jake, the Vitaminbar provides every nutrient you body needs. The Vitaminbar packs about 20 grams of protein and at least 25% RDA of every vitamin and mineral, next to a good amount of healthy, filling fibres. The bar doesn’t need refrigeration and stays fresh for about 3-6 months. You can bring the bar with you anywhere or just store it at those places where you know they’ll come in handy. The Coffee Cacao Vitaminbar provides 104 mg of caffeine. That’s about the caffeine of one regular cup of coffee. Did you know that the effect of caffeine peaks at about 45 minutes after consumption? So if you want to be at your best for that meeting at 5 in the afternoon, have a Coffee Cacao Vitaminbar around 4. Cacao is full of antioxidants and minerals like zinc, magnesium and copper. And that’s all great, but does anyone really eat cacao because of its flavonoids? It’s simply delicious. And the combination of cacao and coffee?